January 12, 2011 - The FAA sent out a Safety Alert for Operators (SAFO) to stresses the importance of ensuring aircraft tires are properly inflated and that there are potential consequences of improper tire pressure which can have on the performance of aircraft operations during Taxi, Takeoff and Landing. The probable causes of numerous accidents have highlighted the importance of ensuring proper aircraft tire pressure. For instance, a Douglas DC-8-61 crashed shortly after takeoff from Jeddah, Saudi Arabia killing all 261 on board. The probable cause of the crash was under-inflated tires, which in turn caused an overheated tire to explode during taxi, which then caused other tires to catch on fire during the takeoff role. The fire continued as the wheels were retracted into the wheel well, eventually causing a loss of hydraulic control and finally an in-flight break-up which destroyed the aircraft. This accident also revealed numerous human factor issues that contributed to the underinflated tire. Recently, the National Transportation Safety Board (NTSB) determined that inadequate maintenance of the airplane?s tires was the probable cause of an accident where a Learjet 60 (N999LJ) overran the runway in Columbia, South Carolina. The inadequate maintenance of tires resulted in multiple tire failures during the takeoff roll due to severe under inflation. This accident took the lives of both flightcrew members and two passengers; two other passengers were seriously injured. 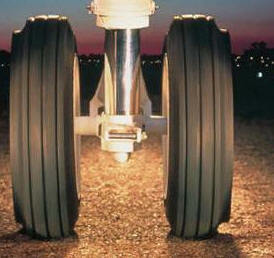 Aircraft tires are designed to carry specified loads during a variety of temperatures and wheel speeds. When aircraft tires are improperly serviced they are severely compromised and catastrophic consequences can occur. The Federal Aviation Administration (FAA) suggests any individual associated with the operation of aircraft under Title 14 Code of Federal Regulations (14 CFR) part 121, 125, 129, 135 and 91 subpart K (91K), including those who perform servicing and maintenance functions at a certificated or non certificated repair facility (maintenance providers), make certain their procedures ensure tire pressure checks frequently to ensure tires remain inflated to within the maintenance manual-specified inflation range. Research has shown that transport-category airplanes can lose as much as five percent of tire pressure per day under typical operations. At a pressure rate loss of five percent per day, it would only take a few days before they require servicing. Tires not serviced within an acceptable range may require tire replacement due to under inflation limitations specified in the maintenance manual. Additionally, servicing of underinflated tires without proper protection such as a tire screen or other protective devices may cause damage to the aircraft or injury to the individual servicing an underinflated tire. Air Carrier Certificate Holders, Fractional Ownership Program Managers, Training Center Managers, Directors of Maintenance, Accountable Managers, Maintenance Providers and others with responsibility for maintenance should become familiar with the SAFO. The SAFO?s intent is to ensure appropriate personnel are made aware of the importance of proper tire pressures, appropriately calibrated tire pressure gauges and servicing safety precautions. The maintenance manual tire pressure interval checks are followed to ensure proper tire pressure is accurately maintained. Failure to follow the published procedures with aircraft tires could result in personal injury or catastrophic aircraft loss.